By the time the folk over at the Christian Post toyed with the press release the story took on a completely different character. from the inside to the outside." The keynote speakers include Bruno Barberis, director of the International Center of Sindonology in Turin, as well as the Most Rev. Michael John Sheridan, bishop of the Diocese of Colorado Springs. The conference is set to open with renowned shroud lecturer Russ Breault. Initial tests conducted in 1988 in Arizona, Oxford and Zurich supported the theory that the shroud is a forgery created in the Middle Ages, somewhere between 1260 and 1390, but later tests in 2011 by Italy’s National Agency for New Technologies, Energy and Sustainable Development came to the conclusion that the relic could not have possibly been replicated by the technology available at that time. Gary Habermas, distinguished research professor and chair of the Department of Philosophy and Theology at Liberty University, led a presentation in 2013 at the Southern Evangelical Seminary’s 20th annual Christian Apologetics Conference and discussed enhanced images of the shroud which showed that the person’s teeth were showing through the skin. "His skin is intact, his beard is intact, but you are able to see what’s inside coming out, just like if you are able to see what’s on the back of a hand," Habermas said during the presentation, while showing a photo of an exposed human skull juxtapositioned next to the head of the man in the shroud, with the teeth from the two images aligned. 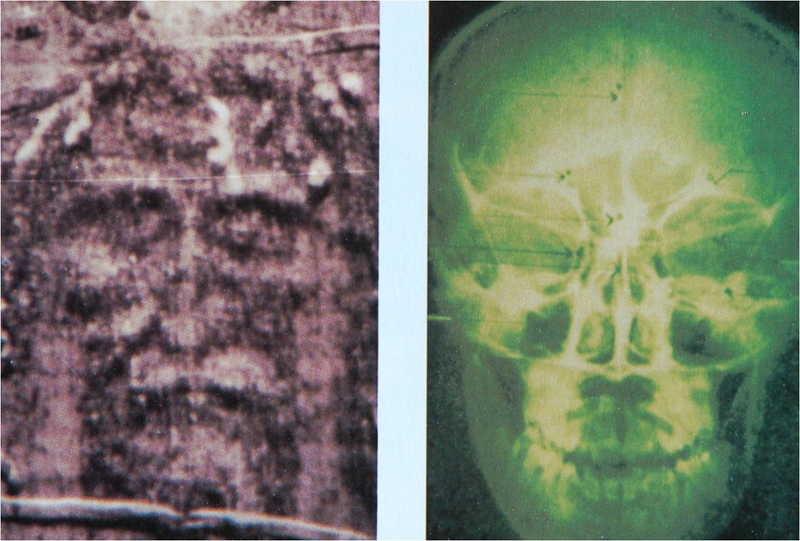 "This is one of the best indications that the man in the Shroud, who was dead and was crucified, [has] radiation coming out," he said of the teeth discovery. "And if that’s what this is, you’ve got something from the inside [coming out]. "[The teeth] are on the inside, but on the photo they are showing outside. Whichever way [the radiation] is coming, it dragged the image from the inside to the outside." I stay on the position that teeth are almost certainly visible on the Shroud face negative. However I reject suggestions of any X-ray projections, such as the teeth are projected “from the inside to the outside”. The mouth is simply open, that’s the reason. And I see no reasonable reasons to deny this.The mouth is open so logically, teeth are visible. No magic here -except for the magic that created image. As Gary Habermas is a well-known evangelical apologist, he sort of uses the Shroud as a prop, but the reporter was mixing things. Wow, I think this is a new level of incompetence for the popular media. The mention of the teeth by Gary Habermas, who isn’t even speaking at the conference, got more space in the article than the conference itself. And they didn’t even list the conference website for people to get additional info. Just noticed they did have hot links to the press release and also the conference site.